This story concerns the cruiser Sussex. When an air-raid warning sounded, the procedure recommended by the authorities was for people in the upper floors of tenements to make their way either to a shelter, remain on the ground-floor in one of the houses, or stay in the common close. The close was regarded as being the safest place in the event of a direct hit, but that really only applied if the close itself was protected with bracing. During the night in question, early on the morning of the 18th of September 1940, the sirens hadn't sounded when we heard noise of AA gunfire, which seemed nearby, and were wondering what to do. Was it a practice shoot or a false alarm? Or was it the real thing? Then after a while we heard the sound of a plane and bombs falling. I recall the noise quite clearly. There were two distinct whooshes which came close together, but strangely the explosions were quite muffled, and although the sirens did sound the warning as we made our way downstairs soon after, there were no further frights that night. It was one of the occasions when my father refused to leave his bed. He maintained that if he was going to die, he preferred to do so in comfort! What had happened was that the cruiser SUSSEX, berthed about a mile away in Yorkhill dock, had just finished loading ammunition and was ready to leave. A stick of four 250lb bombs (numbers 17 to 20 on the SRO list) plus two incendiaries, were dropped (which doesn't square with the two whooshes heard). One landed on Hayburn Street/Beith Street bowling green and broke through both Corporation Transport underground railway tunnels. This caused water from the nearby river to flood in which put the system out of use until the end the following January. The second bomb landed to the south of Castlebank Street, while another hit Yorkhill Quay. But it was the fourth (probably number three in the stick) that caused the greatest upheaval. While the SRO list does not indicate this, it says simply Yorkhill Basin. The bomb crashed through the cruiser's decks near a fuel vent and lodged low down in the hull, but failed to explode. If it had gone off the load of ammunition would probably have been set off as well, causing immense damage over a wide radius. It did however start a fire in the bowels of the ship which threatened to get out of control, and it was obvious to those in charge that unless it could be stopped from spreading it would certainly reach the munitions. Fortunately the order to open the seacocks was given in time, flooding the ship and causing it to settle on the bottom. This helped put the fire out which saved many unknowing lives. Of course the event was hushed up at the time but we did hear a story about a bomb falling down the funnel of a ship at Yorkhill, and oddly enough the subway was shut down just then, which indicated to us that something unusually serious had happened in the Yorkhill area. The details of the above story were gathered from various sources over succeeding years, but a book encountered fifty seven years after the event gives a much more authoritative account. In CLYDE BUILT by John Shields, published in 1947, chapter 12 page 84, in a brief history of ALEXANDER STEPHEN and SONS, he relates that it was an incendiary device which penetrated a trunkway to the fuel tank of the County class cruiser HMS Sussex. This was probably a vent to atmosphere rising above the superstructure for bunkering. The incendiary started the fire from which the events related above followed. The account goes on 'when she was refloated it was found that the fire had caused so much damage that everyone expected the cruiser to be scrapped; but the nation was in desperate straits for naval tonnage, and it was decided to repair it. Stephen and Sons were given the job, and after many months the cruiser was once again put back in service as a unit of the Royal Navy'. Another event which occurred shortly after the above, was seeing a cargo ship of medium size, being brought into Merklands Quay with a spectacularly damaged superstructure. A story circulated that a bomb had fallen down the funnel. The ship lay there for a few days then disappeared, probably taken elsewhere on the river for repair. Those two events taking place so close together produced a confused story of mixed details, a tale that was taken for the truth, until later reading brought for the true story of what happened to HMS Sussex. But I never found out what became of the ship with the crumpled funnel. The above (and much, much more) courtesy of George Rountree - In 1993 my first book of childhood memories entitled A GOVAN CHILDHOOD - the 1930s was published by John Donald of Edinburgh. The above is an extract from the second book, the as yet unpublished continuation. Very interesting story about the 'Sussex' Apollo. I notice the mention of the air-raid sirens here. As mentioned earlier in my own account of that night, I mention not having heard the sirens, neither the 'warning' nor the 'all-clear', which could well have been because of being asleep. I'm a bit puzzled though, as to why we hadn't gone down to the close mouth if the 'warning' siren had sounded, as this was our usual practice. I'm a bit puzzled too, as to why the schools weren't closed following an air-raid...unless of course they were closed and I am simply mistaken, which after all these years is very likely. The one thing I'm not doubtful about regarding that night is the intensity of the AA fire: it was very heavy. This leads me to wonder if 'two distinct whooshes' could have been identified from among the great variety of sounds of AA explosions...especially from a distance of about a mile. Maybe a trained ear could, I don't think I could have.
" GLASGOW, SCOTLAND, 1940. BOMB DAMAGE INFLICTED ON THE CITY BY FIRST THOUSAND BOMBER RAID, DAMAGE TO SHIPPING"
Thousand bomber raids were only carried out by the British and Americans, never by the Germans, certainly never on the Clydeside. Even in the big Blitz of March '41, the number of planes wasn't close to 1000. A oblique aerial shot has been added to the RCAHMS digitised collection recently, showing the camp and battery at Blantyreferme on June 6th 1941. If anyone can provide further details on what we're looking at, I'd be very obliged. The pic is also interesting for showing the various industrial sites around the Newton area in the background. I was particularly interested to see that Redlees Quarry, just to the west of the camp, had not yet been excavated (the pic is taken looking NW). I suspect the quarry workings and associated spoil heaps may have been responsible for much of the damage to the site. Almost 60 years later the house where I sit will be built about 1" out of frame in the bottom left hand corner. Interestingly it would appear that the Blantyre Ferme Road road must have been rerouted round the site in the process creating one of the nastiest corners in the Glasgow area. On the maps these days Blantyre Ferme road is marked as Blantyre Farm Road which causes much confusion as Blantyre already has a Farm Road. I suspect the older name spelling indicated it was a private road from the french for closed rather than ferm for farm. The roads were not altered when the battery was established. OS 1st ed 6-inch map shows the roads exactly like the layout today. The site is a pretty standard layout. Accomdation camp by the road, the offices, mess complex account for some of the rest of the buildings. The guns themselves are the four features by the crescent shaped road. The command post for the guns is the small feature on the other side of the cresent road. The 2 rectangular buildings I think are the ammunitions magazines. The large hexangonal area of cut grass to the north of the guns is the gun laying (gl) mat, part of the radar system and calabrating the guns. Growing up near Kings Park on the Southside in the mid 1970/80's I was always intrigued that Aikenhead House in Kings Park played a vital role in Glasgow Air Defences during WW2. Although by then there wasn't any visible signs of it's wartime role to be seen. Even after gaining entry to retrieve a fitba' I kicked up onto the roof in the early 80's. The interior had been stripped bare following an unsuccesful bid to convert it into a museum with the exception of some very grand fireplaces. Which were at some time later destroyed by vandalisim. Any how, I've only ever seen the much published photo shown below. 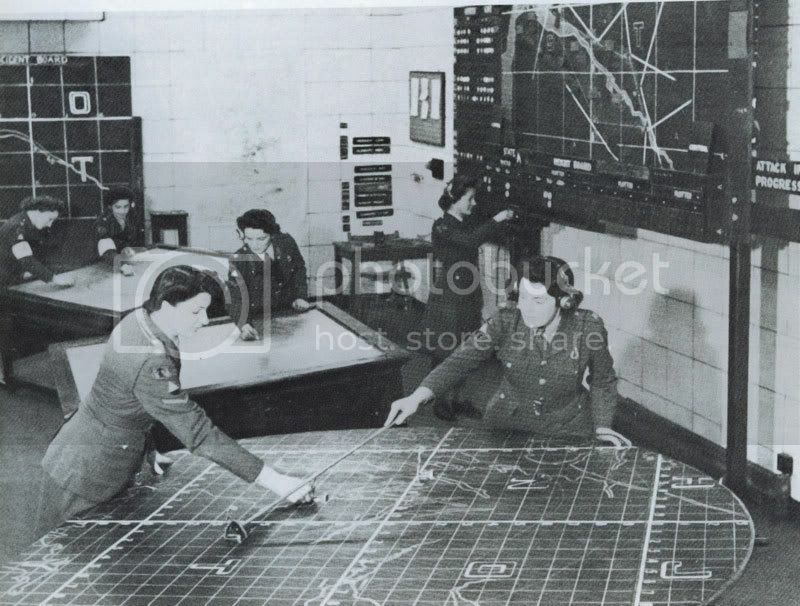 I presumed that the Anti Aircraft Control HQ of the Royal Artillery was housed somewhere in either the basement or in one of the wings of the house. However while reading Glasgow from the Air there is a superb photograph taken in c.1950 showing the house and surounding suburban house. There is also a nissen hut partialy obscured by trees in just south of the Op's room. 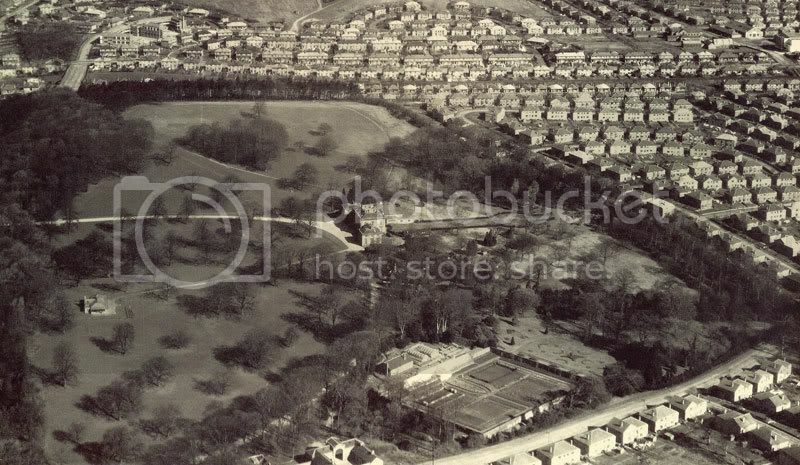 Finaly in the same pic I can make out my parent's old house (top right building with the light coloured roof) with Air raid shelter at the bottom of the garden. My folks had it demolished soon after we moved in sometime during the early 1970's as it was in a state of collapse. You can make out neighbouring houses with shelters still in place. Couple of rare views of barrage balloons. 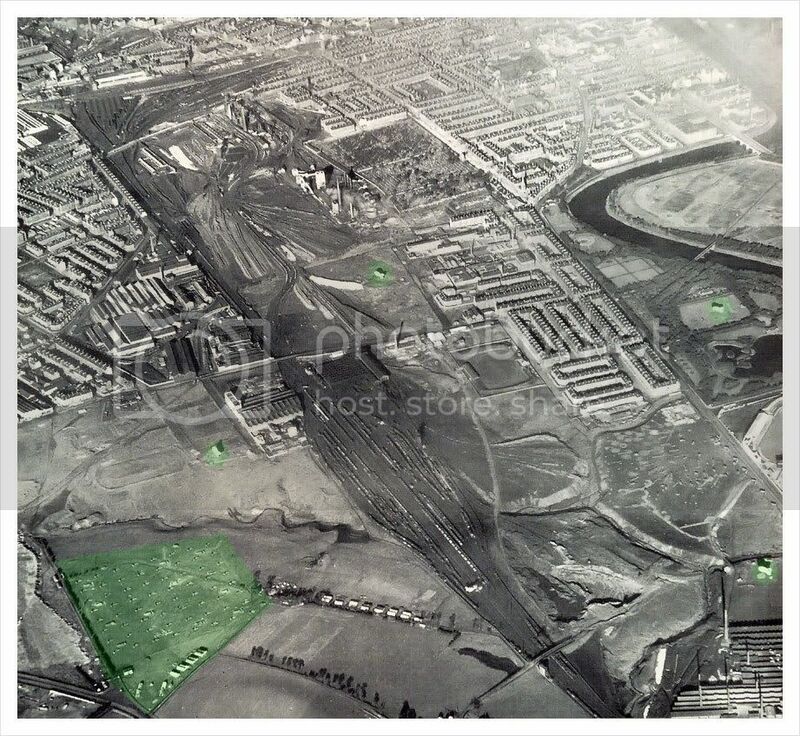 Located at various sites backed up with a large Heavy Anti Aircraft Battery at Toryglen (area marked in green) that provided cover for the strategic locations of Polmadie Railway Depot, North British Queen's Park Locomotive Works, Whites Chemical Works and Dixon Iron Works all which played a vital role in war production. The large site in the photo is not a heavy aa battery, although CANMORE does confirm that one was there, but it was replaced by a Z-battery which is what you can see on the photograph. A Z-battery lauched rockets against the planes. A 'Z' battery of unrotating fixed projectile rocket launchers was situated about 250m NW of what is now Toryglen school (itself on the site of the heavy anti-aircraft battery NS66SW 114). The battery is visible on a wartime RAF oblique air photograph (No.1 CAM oblique, x902, flown 21 October 1941) as rows of small huts with the accommodation camp for the personnel situated to the E and NE. This 'Z' battery is noted in PRO document (WO 166/7309, 6 AA Gp letter) dated 27 October 1942 and is recorded as being armed with 64 U2P (unrotating projectile) twin barrelled launchers and supplied with radar in the form of GL Mk1. It was manned in december 1943 by 101 Battery Home Guard as part of 107 Battery. PGCC937, regarding that great picture of the barrage balloon floating high above Meadowside granary in 1941, I think I can identify the granary, but I can't see a thing on the other side of the river that I could identify. I lived in Govan a long time so i had hoped to see something I knew, but alas, no joy. Can anyone tell me, for example, where the Elder Park is? If the granary is the rectangular building on the lower left, the two yards on the other side of the river must be Stephens' and Fairfields' yards...but where is the Elder Park? Dugald wrote: PGCC937, regarding that great picture of the barrage balloon floating high above Meadowside granary in 1941, I think I can identify the granary, but I can't see a thing on the other side of the river that I could identify. I lived in Govan a long time so i had hoped to see something I knew, but alas, no joy. Can anyone tell me, for example, where the Elder Park is? If the granary is the rectangular building on the lower left, the two yards on the other side of the river must be Stephens' and Fairfields' yards...but where is the Elder Park? If you look at the balloon top centre, to the right of that are a block of sheds, immediately below this is water row, and to the right of the tenements of water row is Govan Old Parish Church. Thank you for the explanation crusty_bint, i think i can make out the Old Govan Parish Church. If the large rectangular block is the granary, then i guess I had it in the wrong location since I always thought it was opposite Stephens'. But if you have the church in the right place , and i'm sure you do, then Stephens' isn't even in the picture, the lower yard must be all Fairfields'. I sure had that wrong. Regarding the balloons, there was one in the Elder Park in the north west corner, right across from Fairfields' drawing office on the Govan Rd. There was another on Nimmo Dr. between Greenfield and St. Consantine's schools. 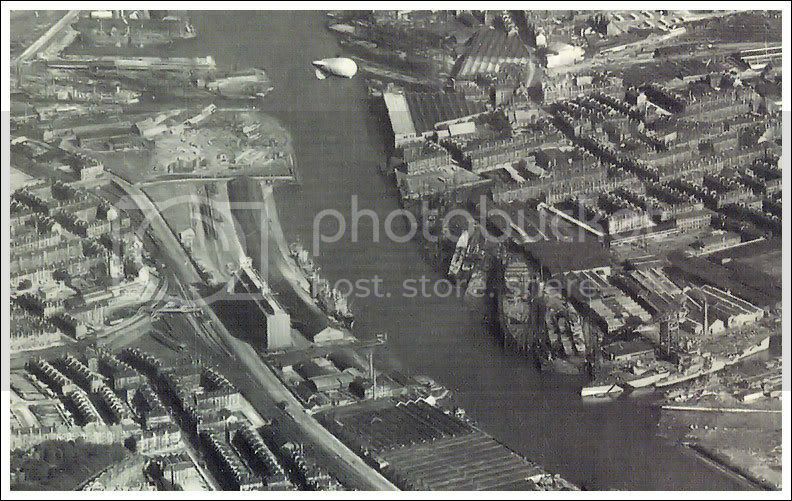 On the south west side of Shieldhall Dock there was another balloon site. Dugald wrote: PGCC93, regarding that great picture of the barrage balloon floating high above Meadowside granary in 1941, I think I can identify the granary, but I can't see a thing on the other side of the river that I could identify. I lived in Govan a long time so i had hoped to see something I knew, but alas, no joy. Can anyone tell me, for example, where the Elder Park is? ? Pgcc93, thank you very much for the first-class view of Govan --everything is as clear as a bell (I can even see every nook and cranny in the Elder Park!). The shipyard is Stephens'. If one goes up from the bottom left corner a distance of 5.5cm and 2.5 cm to the left (assuming a normal-sized screen), one will see the vacant land gap in the row of tenements on Govan Rd. where a land mine hit during the '41 blitz; this is right beside the engine shop in Stephens. I took another look at your earlier picture on this thread and there is now no doubt the lower yard is Fairfields. I can make out the big crane on the fitting-out basin... I wonder if the big ship sitting beside the crane is HMS Howe. I think it could be...anyone able to identify a battleship stern? Great stuff Pgcc, and thank you for posting the PM. Cheers, Dugald. Dugald wrote: Pgcc93, thank you very much for the first-class view of Govan --everything is as clear as a bell (I can even see every nook and cranny in the Elder Park!). The shipyard is Stephens'. If one goes up from the bottom left corner a distance of 5.5cm and 2.5 cm to the left (assuming a normal-sized screen), one will see the vacant land gap in the row of tenements on Govan Rd. where a land mine hit during the '41 blitz; this is right beside the engine shop in Stephens. Dugald doesn't know his left hand from his right hand: the bombed-out site distances are measured from the bottom right-hand corner.